Toxic shock syndrome (TSS) is a condition caused by bacterial toxins. Symptoms may include fever, rash, skin peeling, and low blood pressure. There may also be symptoms related to the specific underlying infection such as mastitis, osteomyelitis, necrotising fasciitis, or pneumonia. Other features include mesenteric lymphadenitis and arthritis. Kidney failure rarely occurs. Relapses occur in up to 50% of patients. 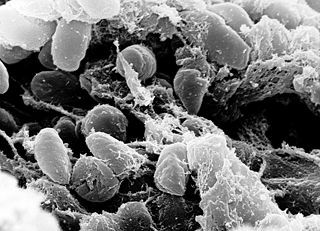 The cause of this disease is Yersinia pseudotuberculosis serotype O1. 95% are subtype O1b. 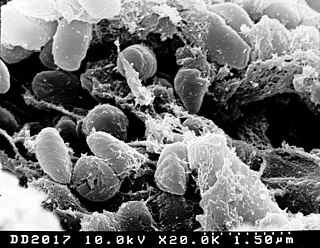 The clinical features of this disease appear to be due—at least in part—to the production of a superantigen—YpM (Yersinia pseudotuberculosis-derived mitogen). This is present in almost all strains from the Far East but only 20% of European isolates. The antigen was discovered in 1993 and is encoded by a 456-base gene. The protein has 151 amino acids, with a signal sequence of 20 amino acids. The mitogenic antigens are scattered across the protein but two cysteine residues (residues 32 and 129) which form a disulfide bridge are critical. The G+C content of this gene is 35%—lower than the genomic average (47%) suggesting that this gene has been acquired from some other organism. The organism from which this gene originated has not yet been identified. This gene seems likely to have been introduced into the genome by a bacteriophage, given the nearby presence of a phage integration site, but the mechanism of entry into the genome is not currently known. The first outbreak of this disease was reported from the Pacific coastal areas (Primorsky Krai) of Russia in the 1950s. Clostridium botulinum is a Gram-positive, rod-shaped, anaerobic, spore-forming, motile bacterium with the ability to produce the neurotoxin botulinum. Dientamoebiasis is a medical condition caused by infection with Dientamoeba fragilis, a single-cell parasite that infects the lower gastrointestinal tract of humans. It is an important cause of traveler's diarrhea, chronic abdominal pain, chronic fatigue, and failure to thrive in children. Malaria antigen detection tests are a group of commercially available rapid diagnostic tests of the rapid antigen test type that allow quick diagnosis of malaria by people who are not otherwise skilled in traditional laboratory techniques for diagnosing malaria or in situations where such equipment is not available. There are currently over 20 such tests commercially available. The first malaria antigen suitable as target for such a test was a soluble glycolytic enzyme Glutamate dehydrogenase. None of the rapid tests are currently as sensitive as a thick blood film, nor as cheap. A major drawback in the use of all current dipstick methods is that the result is essentially qualitative. In many endemic areas of tropical Africa, however, the quantitative assessment of parasitaemia is important, as a large percentage of the population will test positive in any qualitative assay. Mycobacterium boenickei is a member of the Mycobacterium fortuitum third biovariant complex. They are rapidly growing ubiquitous environmental organisms that normally inhabit soil, dust and water. These organisms frequently are human pathogens that cause a wide spectrum of clinically significant disease. It is important for practitioners to be aware of these organisms as possible etiological agents, as they are resistant to most first-line anti-tuberculous agents. Toxic shock syndrome toxin (TSST) is a superantigen with a size of 22 kDa produced by 5 to 25% of Staphylococcus aureus isolates. It causes toxic shock syndrome (TSS) by stimulating the release of large amounts of interleukin-1, interleukin-2 and tumour necrosis factor. In general, the toxin is not produced by bacteria growing in the blood; rather, it is produced at the local site of an infection, and then enters the blood stream. Anti-streptolysin O is the antibody made against streptolysin O, an immunogenic, oxygen-labile streptococcal hemolytic exotoxin produced by most strains of group A and many strains of groups C and G Streptococcus bacteria. The "O" in the name stands for oxygen-labile; the other related toxin being oxygen-stable streptolysin-S. The main function of streptolysin O is to cause hemolysis — in particular, beta-hemolysis.